Often as we come closer to fulfilling a burning dream, to honouring our creative yearnings, to saying YES to our authentic, alive, tingling selves, there’s a backlash. The equal weight of fear kicks in. It can be a tidal wave of doubt demons or the quiet ooze of avoidance and excuses. E might equal mc squared; I wouldn’t really know. But I do know that over twenty years’ experience of working and playing with my own creative process and that of others reveals that the Great Stultification can equal the surge of Creative Life Force. I see Art and Soul clients whose creativity has been stomped on, squashed, dampened and battered. And yet, the creative spirit inside them, inside you and me, inside all of us, is still alive. With a bit of encouragement, it can flourish. Long ago, in the protozoan days of this thing called a weblog, I thought I might like to partake. I love writing and painting. I love sharing stories of the nitty gritty realness of what it’s like to create and to not-create. Who am I to put my thoughts and creations out in the world? What makes me think I’m so special? What if my writing’s not good enough? What if it’s too longwinded/clipped/boring/overblown/glib/flippant/light/heavy/serious/self-indulgent/obscure/samey/been done-to-death? Then there’s the exposure. Oddly, I find writing much more personally exposing and risky than painting. It seems I am not unlike you. I have creative urges, longings, aspirations alongside fears, inner criticism, procrastination. My creativity is both strong and vulnerable, just like yours. So here it is. The blog is born. My nakedness is here for you to see. I am willing after all to risk your sneering at my pockmarks, age spots and funny-looking fat bits, in the cause of celebrating creativity – yours and mine. In the service of helping you connect with your creative power. If you feel a biscuit crumb more inspired and affirmed as a creative being than you did before you read Blogbirth, I am satisfied. Let’s connect with creativity in community. In a couple of sentences or so, what are your questions or comments about birthing artistic creativity? Do you have a creative project you want in your deepest heartfelt being to bring to fruition, yet you are mysteriously, frighteningly, thunderously blocked? How might you nurture your creativity along? Have you sought support for your strong, beautiful yet fragile creative spirit? What steps might you take? Birthing a Blog original image by Sally Swain please note the rather large umbilical cord from head to….what? another external embryo? Maybe. 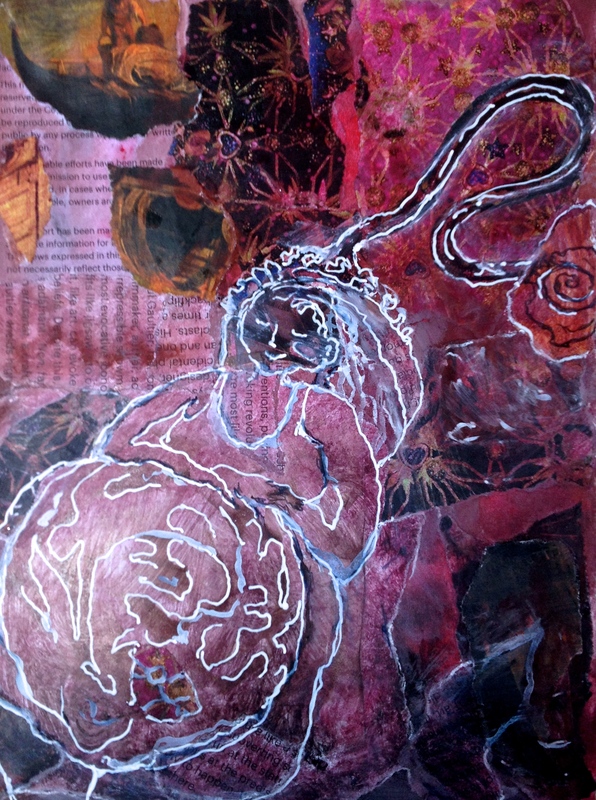 This entry was posted in creative beginnings and tagged beginning, creativity, inner critic, painting, writing by Art and Soul Space. Bookmark the permalink. Wow what and impact-full statement Sally…. I’m sure I’ve had lots of creative ideas I haven’t followed through with (though some that I have). This blog has given me some food for thought already. One of the things that gets me caught up is doing all the stuff I think I ‘have to’ do before I can ‘really relax’ and take some time for myself… it’s something about having permission I guess. Thank you so much Stuart James – for making the first (and clearly most wonderful to date) comment on this brand new blog! Glad to have provided food for thought. That’s what it’s all about. Hope some inspiration too. And you raise some great topics. ‘Permission’ is a big one, associated with believing we deserve to have creative space and time for ourselves. Thanks once again, for getting the ball bouncing. Lovely I now feel I have some words from the Sally Swain vocab which might help me when needed, I can say,”Why are you feeling mysteriously, frighteningly, thunderously blocked?”, and there will be a smile before the I don’t know and maybe an answer will be forthcoming sooner. Congrats brave one I love it. Hope they do smile and don’t just fall backwards – splat – when they hear such words as ‘mysteriously, frighteningly, thunderously’ all in one go. Beautiful, brave and yes, born. Congratulations, its a – wonderful thing. I do it all the time, drive around my precious creativity with feet on both brake and accelerator pedals – and then wonder about the exhaustion and pointlessness of it all. Loved Liz Gilbert’s historic and special take on it where the genius of creativity came through you rather than was you – a disembodied spirit that both helps and protects (from both despair and self-aggrandizement. Thank you Rosalie, infinitely creative being that you are. Love the metaphor of brake and accelerator. And yes – I too find Liz Gilbert’s talk inspiring, validating, affirming. Great to share it here. Happy arty motoring, coasting, gliding.